You know the drill: You’ve got visitors coming to town in a week and you’re tasked with picking a place for dinner, savvy New Yorker that you are. But what’s perfect for your college roommate might not be so perfect for your 20-year-old cousin. Here’s your cheat sheet to the best restaurants for every kind of guest. She hails from another serious food destination, so expectations are high. Show her what some of the city’s most inventive chefs are cooking at Estela, Wildair (pictured) or Upland. Auntie Jean and Uncle Barry aren’t the most adventurous eaters, but that doesn’t mean they don’t deserve an epic meal. Peter Luger, Houseman or Quality Eats (pictured) will sate their finicky palates while being delicious for you, too. C’mon, you know at least one. She’s less concerned with the food than its “like” potential, but you know better than to waste the opportunity for a good meal. Take her to Reynard, Maman or Café Clover: She’ll swoon over the ambience, and you’ll be too busy eating to notice. This couple used to be the experts on where to dine until they left town a few years ago. They’re dying to hit up the hot spots, but now they’ve got a toddler in tow. All three of them will have a great meal at Franny’s, Thursday Kitchen or High Street on Hudson. Instead of a sit-down meal, this FOMO-afflicted friend would prefer to sample as many things as possible. 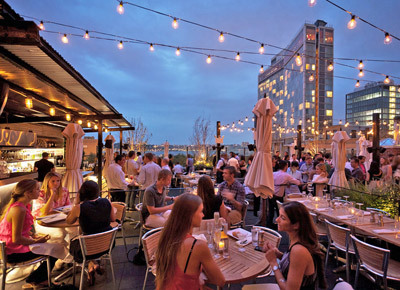 Give him the fancy-food-court experience at Great Northern, Eataly and Union Fare. The more far-flung the cuisine, the more she likes it. If she’s up for it, spend a day food crawling through Jackson Heights; if that’s not an option, hit up Biang! (pictured), Her Name Is Han or Babu Ji. Hey, a delicious, filling meal does not have to break the bank. Your friend will appreciate the under-$10 eats at Taïm, Banh Mi Zon and Caracas. This calls for somewhere cozy where you can chat it up over a bottle of wine or two. Locanda Vini e Olii, Lighthouse or Epistrophy will do the trick.